You can install the theme automatically or manually. It's better to install TheSaaS on a fresh WordPress installation. The easiest way to install (and later update) your theme is to use the Envato Market plugin. Just download the plugin and follow the installation guide from Envato. Extract the zipped package downloaded from ThemeForest to your desktop. In the extracted package you will find thesaas.zip which is the WordPress theme file. Select the theme .zip file in the theme package downloaded from Themeforest and click Install Now. Navigate to the Appearence > Themes page. 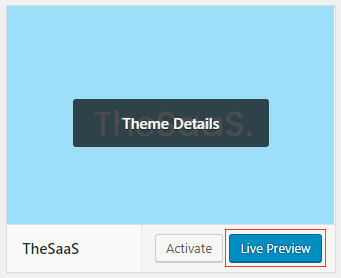 Find TheSaaS and press Live Preview button. 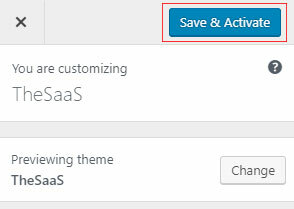 In the new opened page, click Save & Activate button on top left side of the page. While installing the theme manually, you may see the "The package could not be installed. The theme is missing the style.css stylesheet." message. Please, open this .zip file, find the theme's .zip file in it, and use it instead.